Danmarks Flymuseum (Danish Aircraft Museum) was established as a commercial foundation on the 19th April 1971 at the initiative of a group of enthusiasts with a special interest in vintage aircraft. 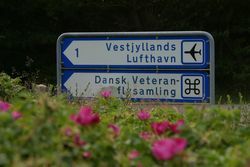 Until 2007 it was known and managed under the name of ‘Dansk Veteranflysamling’ but after the expansion 2006, it changed its name to ‘Danmarks Flymuseum’. The principal purpose of the museum is to raise awareness about flying, in order to provide an opportunity for the general public - as well as specialised enthusiasts - at home and abroad, to participate in the thrill of flying. The main emphasis is on the history of Danish flying and aircraft production, both civil and military. But the museum is not a stagnant display of artefacts from the past: it ‘lives’ and is in constant development: adding new theme exhibitions, inspiring the formation of interest groups and involving new volunteers – young and old - in all aspects of the operation. The operation includes commissioning and restoring new aircraft and accessories related to flying for the exhibition, as well as maintaining the existing ones. So far, more than 16 aircraft have been restored to airworthy condition. Altogether more than 60 aircraft are currently in the exhibition, including gliders, vintage planes, jet fighters and helicopters. 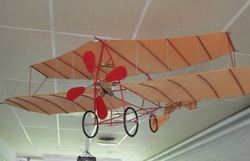 In addition, there are theme exhibitions with specific subjects, both permanent and temporary, such as the collection of about 1,000 model aircraft and the exhibition celebrating the 100 years’ anniversary of the Wright brothers. The museum houses a complete collection of the Danish KZ aeroplanes, manufactured by Scandinavian Aero Industry in conjunction with V Kramme and K G Zeuthen between 1937 and 1954. 11 different types of KZ aeroplanes were constructed, and together they demonstrate pioneering Danish technical know-how at a time when such construction was much more difficult than today. Danmarks Flymuseum is justifiably proud to exhibit this unique piece of technical and industrial culture to current and future generations of aviation enthusiasts. The 4,000 square metre expansion of the museum that was completed in September 2006 made it possible for Danmarks Flymuseum to handle larger aircraft, and the new exhibition hall houses a separate museum established for RDAF. This means that RDAF now has its own museum, hosted by Danmarks Flymuseum, comprising their considerable collection of aircraft and equipment that have been used in Denmark spanning the first Danish military aircraft from 1911 to the F-16 jet fighter of recent times. 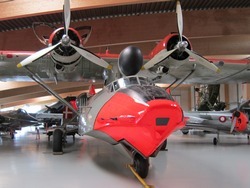 It is a unique cultural treasure of the highest standard, which Danmarks Flymuseum is now proud to exhibit to Danes as well as tourists from abroad. During the last decade, AcM-DK has worked diligently towards the expansion of the museum and the highest technical standards for all the exhibits. The result is that we can now offer a unique collection of treasures with both national and international cultural significance. 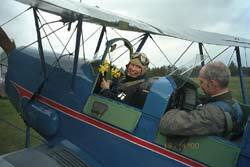 Thus Danmarks Flymuseum is firmly placed in the cultural landscape of Western Jutland. Danmarks Flymuseum is a ‘technical’ museum with an origin in aviation that has always fascinated many people. Besides, it is a ‘living’ – or ‘flying’ - museum, in the sense that several of our aircraft are, as far as possible, maintained in a flightworthy condition, enabling us to show them in the air, as they are originally intended. Over the years, the museum has participated in preserving many hundreds of irreplaceable artefacts thus giving future generations in Denmark and beyond a comprehensive insight in the history of aviation in general and Danish aviation in particular. Western Jutland is an area of huge importance for the Danish tourist industry. The stunning North Sea beaches and the area around Skjern and Ringkoebing Fjord offer an abundance of holiday cottages and camping sites attracting tourists from near and far, especially in the summer months. A visit to the museum is just one of the alternatives available to holiday makers, when the weather does not invite swimming, surfing and other beach activities. Throughout the museum’s existence, the number of visits from schools, academies and technical colleges has been growing. 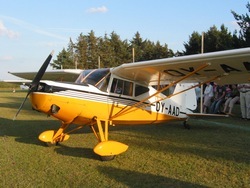 AcM-DK demonstrates in a detailed and entertaining way the development of the aviation industry. Although the emphasis is on the pioneering role Denmark had in the past, the museum’s exhibitions are capable of generating an interest for life in young people from anywhere in the world. The educational importance of the museum Throughout the museum’s existence, the number of visits from schools, academies and technical colleges has been growing. Danmarks Flymuseum demonstrates in a detailed and entertaining way the development of the aviation industry. Although the emphasis is on the pioneering role Denmark had in the past, the museum’s exhibitions are capable of generating an interest for life in young people from anywhere in the world.